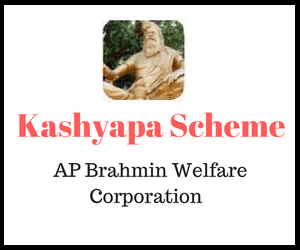 Andhra Pradesh Brahmin Welfare Corporation (ABC) Limited, ( A Government of Andhra Pradesh undertaking ) is introducing “Kashyapa Scheme for Food & Shelter" to help poor Orphan children , Differently abled, Widows and Elderly Brahmins with financial assistance for meeting their Food and Shelter expenses.This scheme is applicable for the poor Brahmins of Andhra Pradesh covering all 13 districts.Under this scheme, an amount of Rs. 1,000/- per month shall be paid to the Orphan children, Differently abled, Widows and Elderly (Rs. 3,000/- per month if any elderly staying in Old-Age home), selected through the prescribed process. Eligible applicants shall submit their applications through online. The applicant should belong to Brahmin community and reside in Andhra Pr adesh. Orphan children below 14 y ears of age as on 1 March 2016, Elderly above 60 years age as on 1 March 2016, all differently abled of any age and widows of any age. Should not have availed himself/ herself any amount under any other Government scheme for the same purpose. How to apply Kashyapa Scheme in online ? Than Click on "Submit" Button. White Ration Card or Income Certificate issued by competent Government authority (Revenue Inspector / MRO). Scrutinising, short-listing and finalisation of applicants shall be done by the State Level Committee (SLC). Rs. 2,000/- per month to Elderly of above 60 Yrs age, staying in any Old-age home in Andhra Pradesh and getting pension through NTR Bharosa Scheme. The above amounts will be credited online to the SB Accounts of selected applicants in the first week of subsequent month, starting from May 2016 (for the month of April 2016) till April 2017 (for the month of March 2017), starting from subsequent month of registration under the Scheme. For those registered from 1st November onwards the disbursal of scheme amounts to the eligible applicants will start from February 2017 (for the month of January 2017) onwards. State Level Selection Committee is authorised to make exceptions in the eligibility / selection process and their decision will be final. Kashyapa Scheme : for Food and Shelter last date has been extended up to 31st December, 2016.